Who doesn’t love S’mores? The combination of graham crackers, toasted marshmallow and chocolate in one bite is to die for. Growing up I never went camping, so I can’t say S’mores remind me of camping trips; however, they do remind of bonfires during my college days. These are by far one of my favorite macaron flavors. What are your favorite flavors? In a food processor, pulse together almond flour, graham cracker crumbs and powdered sugar for about 30 seconds. Continue to whisk until stiff peaks have formed. Peaks should be shiny and smooth. Using a piping bag fitted with an Ateco 304 tip, pipe 1-1.5 inch circles. Once the sheet pan is full, tap the bottom of the sheet pan against the counter to get rid of any air bubbles. 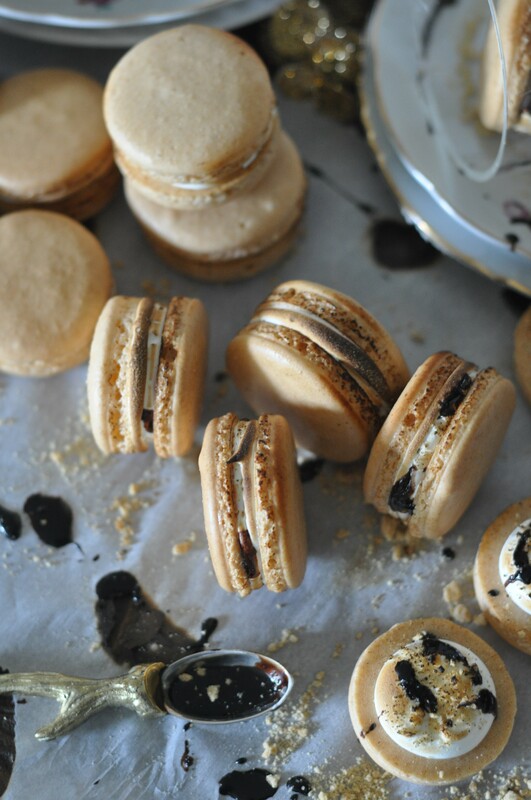 Allow macarons to rest at room temperature for 45 minutes to 1 hour. Bake at 300F for 10 minutes. Rotate and bake for another 8 minutes. Transfer the mixer bowl to the mixer. Using the whisk attachment, whisk on medium speed until mixture is cooled. Continue to whisk until the mixture becomes stiff and meringue-like. Once the macarons shells have cooled, pipe meringue in the center and slightly torch the meringue. Sprinkle some graham cracker crumbs and drizzle melted chocolate (I used a chocolate sauce I purchased from Oliver Napa Valley). Filled macarons can be kept in the refrigerator in an air-tight container for a few days. These Look divine! Great photos! Thank you @Reyshelley! Appreciate you stopping by my page!